An Atala, a word I had never heard before that reminds me of the blockbuster film Avatar is a small black and red butterfly. 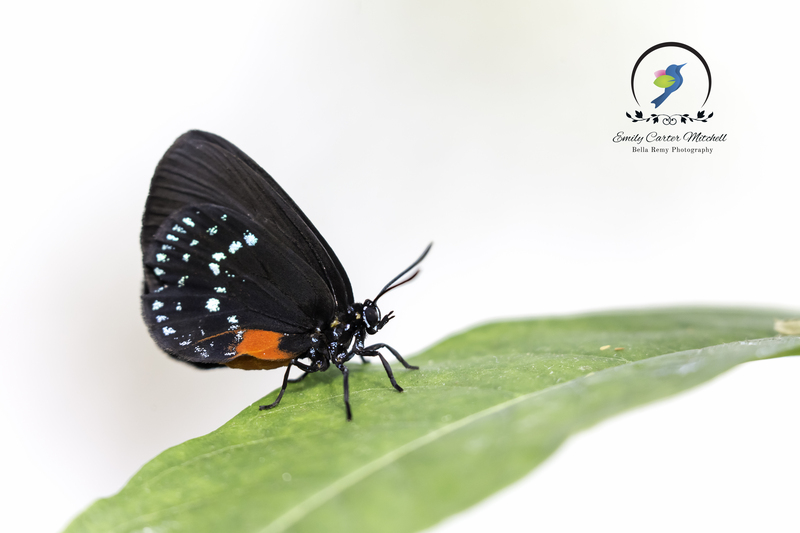 The Atala can be found in Southeastern Florida, Cuba and the caribbean islands of Cayman and the Bahamas. The origin of the word Atala comes from Ancient Greece meaning ‘young.’ It is also used in the Indian language meaning ‘stable.’ Just think, being young and stable. Wouldn’t that be a marvelous thing? This lovely Atala wasn’t the only tiny butterfly in the “Wings of Fancy” exhibit at Brookside Gardens. Another one, more elusive was seen. 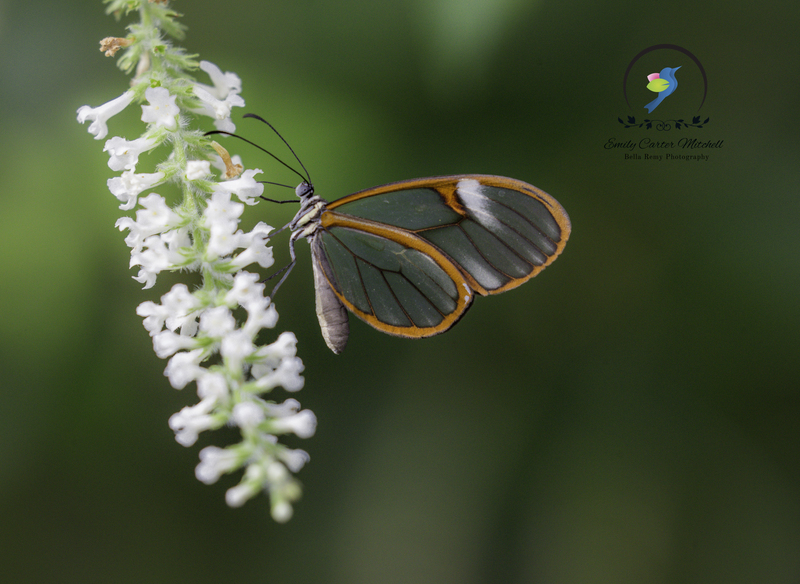 A Greta Oto, or more commonly known as a Glasswing Butterfly comes from Central America. In Spanish, they are named ‘espejitos’ or little mirrors. Now let’s get a little technical. When photographing butterflies, many people think to use their macro lens to capture them. After all, they are little subjects right? Well, I discovered that photographing butterflies with my 500mm lens was actually a brilliant thing to do. Entirely by accident one day while birding, I saw some butterflies in a bush so I began photographing them. The best thing was that the butterflies were completely unaware of me as I was at a distance. Many times when I tried to get closer to butterfly, they would flutter off. So using a telephoto lens allowed me to get close to them without disturbing them. For this butterfly outing I was using a Canon 5D Mark III with the new 100-400mm L lens paired with an extension tube to reduce the minimum focal distance. There wasn’t much light early in the morning, so I used a tripod with a ball head and remote trigger switch. Exposure for these captures were 1/200 sec, f/6.3 at ISO 1600. They’re tiny too. Who knew?! Magical works of art. Espejitos? I simply love that! Beautiful pictures too! Yes ! Espejitos. What an awesome name. Why mirrors versus glass escapes me though. Thank you my dear. glass wing butterfly is gorgeous! So thrilled that I was able to share one with you. Thank you so much for your visit and comment. I agree on being able to take a photo from a distance to not upset my subject. I can’t do that, so I’ve become the fastest non moving photographer! I move when the insect isn’t looking, like the game ‘redlight/greenlight’! Kind fun, but not very successful. .. I love it..fastest non moving photographer. I can only see you now in the field. Red light/green light. LOL !! My first time to see a glass-winged butterfly. So beautiful. Wonderful that I was able to bring something new to your world. Thank you so much Hyorin.